Wait, two more disclaimers: The following are new perennials that I think have value and are worth checking out. But remember, my taste is not better than yours. When it comes to picking perennials for your private parcel, your taste is better than mine. Or at least, if you like it and I hate it, it’s your money. Second, some of these are not brand spanking new. I like to wait for a few seasons to see how well a “new” perennial variety fares in real gardens, not some Zone 7 Oregon test patch. 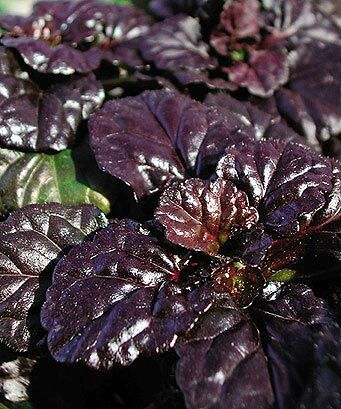 Ajuga reptans ‘Black Scallop’ – Scalloped, dark burgundy leaves appear nearly black. Part shade. H 4-6” W 36” Zone 4. Winter mulching in Z4 recommended. Proven Winners selection. Alcea rosea ‘Queeny Purple’ (Hollyhock) – Lousy name for a nice Hollyhock that doesn’t get so tall it needs constant surveillance. Semi double, 3-4” rose-purple flowers with powder-puff center. Green foliage, compact form. Full sun/part shade. H 20-30” W 24” Zone 4. 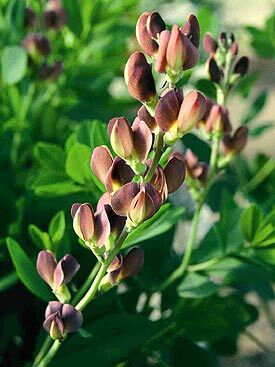 Baptisia ‘Twilight Prairieblues’ (False Indigo) – An improvement, perhaps, on the true native B. australis, though hardy only to Zone 4. Grow B. australis in Zone 3. Long-lasting flowers emerge burnt red before aging to deep violet. Delicate, highly attractive blue-green foliage. Full sun/part shade. H 3’ W 3’ Zone 4. Echinacea Big Sky™ series (Coneflower) – Newest in this new series is a dwarf, ‘After Midnight’, dark purple, fragrant flowers, blue-green foliage. Full sun. H 12” W 12” Zone 3. The series features additional attractive cultivars. 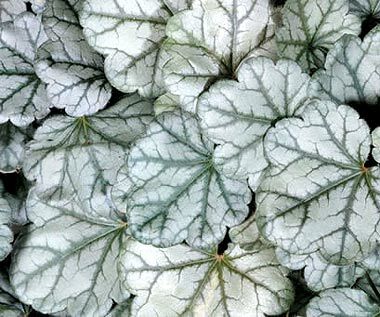 Heuchera ‘Dolce Mocha Mint’ (Coral Bells) – Silver foliage with heavy silver-green veining. Coral flowers that often rebloom in fall. Good sun/heat tolerance. Proven Winners selection. Full sun/part shade. H 15” W 14” Zone 4. See top of page. Iris sibirica ‘Forrest McCord’ (Siberian Iris) – Rich blue flowers with crisp white edge around the falls. Is there a bloom form prettier than that of the iris? Full sun/part shade. H 36” Zone 3. Iris germanica ‘Warrior King’ – Deep scarlet red flowers. Really pops. More new gardeners should grow irises, beginners think they’re tricky and they’re not. Full sun/part shade. H 36” Zone 3. Paeonia ‘Raspberry Charm’ (Peony) – Rich raspberry-red, semi-double flowers with yellow center. This may mark the first reference to Peonies on the entire site. Full sun. H 36” Zone 3. Phlox paniculata ‘Peppermint Twist,’ above and Sedum spectabile ‘Black Jack,’ below. 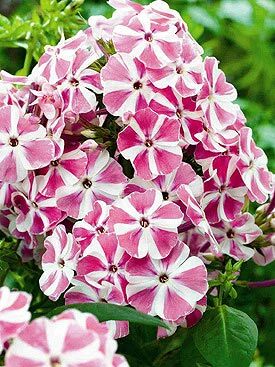 Phlox paniculata ‘Peppermint Twist’ (Garden Phlox) – Flower petals are pink with broad white stripes. Nice for the cottage garden, perhaps a bit drunken to be seen elsewhere. Claims are, yet again, that this cultivar is mildew resistant. Full sun. H 16” W 16” Zone 4. Phlox subulata ‘White Delight’ (Creeping Phlox) – Vigorous, matting green foliage with white flowers. Full sun. H 6” W 12” Zone 2. Sedum x ‘Autumn Charm’ – Green and white variegated leaves show off the bronze-red flowers. Let’s see if it stands up. Full sun/part shade. H 18” W 18” Zone 3. Sedum spectabile ‘Black Jack’ – A sport of ‘Matrona’ (another fine tall sedum), BJ has dark purple-bluish foliage that makes the large, pink flower heads leap out after they mature and lighten. Full sun. H 24” W 24” Zone 4. Sedum telephium ‘Bon Bon’ – I toss this one in because it’s Zone 3, but also a neat new sedum. 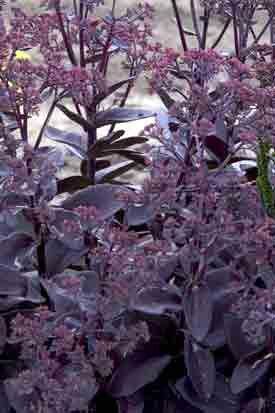 Dark chocolate foliage with early blooming pink flower heads. Full sun/part shade. H 16” W 16” Zone 3. Thymus cherlerioides ‘Silver Needle’ (Thyme) – Silver foliage (more of a silvery green) comes to Thyme. Small pink flowers in late summer. Superb groundcover for between paving stones. Full sun. H 2” x W 18” Zone 4. Hey, guess what—that’s it for new monthly updates until fall. Before you leave the site, be sure to check out the updated Plant Spotlight, Top Pick, Don’t DO That, and Myth of the Week (if I come up with one), because beginning May 1, updates will consist of a brief, pithy note about my chaotic landscaping season, the weather, my son’s band, and any cool new CDs I’ve stumbled onto. Oh yeah, plus two or three timely and pertinent articles from the Archives. Same goes for Plant Spotlight, Top Pick, etc.—Golden Oldies from the Archives. Have a great gardening season, comrades. See you in late fall.